Serious study of Scripture must always play an important role in guiding the development of creationist models. Here, Hebrew terms used in the creation account of animal life are examined to assess their potential as taxonomic terms. It does not appear that God intended to give us a list of taxonomic terms. Instead, the accounts appear to reflect the fact that God created all life in “every corner” of the earth: sea, sky, and land. Life in all these regions is animate and active. God put them under the dominion of people and provided for them. Of all the groups of creatures listed, the birds (עוֹף, ‛ôp) appear to be used most consistently. These winged flying creatures include more than just birds, but also bats and flying insects. Since the creatures in the water and sky were created on a separate day from terrestrial creatures, there may be some discontinuity between these groups that could be useful in developing creationist taxonomies. Further detailed study of Scripture and baramins is necessary before reaching strong conclusions on this matter. 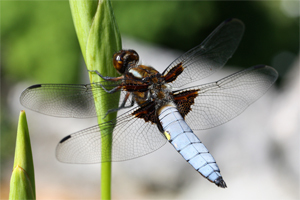 Dragonflies clearly have wings and fly, suggesting that they are from a baramin within the ‛ôp (flyers) created on Day 5. The larval form (nymph) develops in the water. The field of baraminology was based on the Genesis account which indicates that God created (Hebrew: בָרָא, bārā’) plants and animals according to their kinds (מִין, mîn). Baraminologists attempt to identify extant creatures which would have descended from a single created kind (baramin). Several baraminology studies have examined Hebrew words relevant to the species studied.2 These have been important, although there is often a limit to the strength of conclusions made from such word studies. Several detailed studies have examined the biblical view of life.3 Additional papers have explored the meaning of the Hebrew mîn and provide a basis for proper understanding of this term.4 These studies have highlighted the fact that plants are not considered alive in the biblical sense, even though they are described as being created according to their kinds. The latter papers also cautioned against assuming that mîn is a taxonomic term. These insights may prevent unwarranted presumptuous conclusions, particularly when examining the unclean animals listed in Leviticus 11 and Deuteronomy 14. There have been several attempts to glean higher level taxonomic information from the creation account.5 As important as such studies are, it appears that several authors have approached the text with the underlying assumption that the Hebrew terms they encounter are inherently taxonomic terms. This introduces a modern bias to interpreting the text that could lead to incorrect conclusions. Instead, we should remove this assumption and determine if any terms appear to be used taxonomically. Even terms that are not strictly taxonomic may still prove valuable in acquiring a more biblically based view of biology. The readily available Hebrew and Greek study tools are extremely valuable in allowing for detailed study of the Bible in the original languages. However, to be used properly they require some basic knowledge of how languages work. Taxonomic terms have a single invariable meaning which applies to a specific object or group. This is not typical of most words in a language. Instead, words tend to have a variety of definitions and a range of meaning. This is why dictionaries typically list several definitions for most common words. Also, different words can overlap in meaning. The degree of overlap is quite variable and depends on the specific word. This should be intuitively obvious to anyone who has used a thesaurus. In determining the exact meaning of a word, the context is important. For example, the word “running” has vastly different implications depending on whether it refers to me or my refrigerator. The readily available Hebrew and Greek study tools are extremely valuable in allowing for detailed study of the Bible in the original languages.6 However, to be used properly they require some basic knowledge of how languages work. A common error I have encountered in Christian circles is for someone to identify what Hebrew or Greek word is used in a specific passage. The person then consults the Strong’s Concordance and finds the definition of that word that they like best. That definition is then placed back in the passage and the person affirms that this is the “true” meaning of the text. This presumptuous methodology can lead to egregious errors in interpretation when it ignores a basic understanding of how languages work as discussed in the previous paragraph. In this paper the usage of Hebrew terms in the creation account and other relevant passages will be briefly examined to see if they likely constitute taxonomic terms. This paper is not intended to be the final word on the subject, but is meant to further the discussion and perhaps give a more realistic view on what can be gleaned from Scripture. It is hoped that future scholarly work will further delineate the meaning of these terms in light of their implications for creationist research. “So God created the great sea creatures and every living creature that moves, with which the waters swarm, according to their kinds, and every winged bird according to its kind. And God saw that it was good” (Genesis 1:21). It seems unlikely that God changed his mind and did something different (v. 21) than what he spoke (v. 20). So it seems safe to assume that the animals mentioned in both verses are essentially equivalent. It appears that two types of creatures are mentioned in verse 20: swarmers (שֶׁרֶץ, šereṣ) and birds (עוֹף, ‛ôp), while a third is added in verse 21, the great sea creatures (תַּנִּין, tannîn, which appears in the plural form in this verse). It might seem reasonable that these great sea creatures could be considered a subset of the swarmers (שֶׁרֶץ, šereṣ) of the waters. However, tannîn is translated elsewhere as serpent (Exodus 7:9, 10, 12; Deuteronomy 32:33) where it clearly refers to a terrestrial creature. Previous word studies of tannîn suggest they were often feared as threatening creatures.8 Perhaps the great sea dwelling tannîn are specified separately here to emphasize that they were created by God and are subject to Him. This could account for the variation in wording and the apparent emphasis that follows in the phrase: “and every living creature that moves, with which the waters swarm.” Further, the qualifier “according to its kind” is applied twice, once after the creatures in the water and a second time after the birds (עוֹף, ‛ôp). “And God said, ‘Let the earth bring forth living creatures according to their kinds–livestock and creeping things and beasts of the earth according to their kinds.’ And it was so” (Genesis 1:24). “And God made the beasts of the earth according to their kinds and the livestock according to their kinds, and everything that creeps on the ground according to its kind. And God saw that it was good” (Genesis 1:25). Both verses list three groupings of land creatures: livestock (בְהֵמָה, behēmâ), creeping things (רֶמֶשׂ, remeś), and the beasts of the earth (חַיַּת הָאָרֶץ, ḥayyat hā’āreṣ). The order and some other details vary between these two verses. For example, verse 25 uses the prefix every (כָל, kāl) before remeś in the same way that it was used before both living creature and winged bird of verse 21. Again this seems to emphasize that God created all life in these realms. Further discussion of the creatures created above continues in the account of the creation of man. “Then God said, ‘Let us make man in our image, after our likeness. And let them have dominion over the fish of the sea and over the birds of the heavens and over the livestock and over all the earth and over every creeping thing that creeps on the earth’ (Genesis 1:26). “And God blessed them. And God said to them, “Be fruitful and multiply and fill the earth and subdue it and have dominion over the fish of the sea and over the birds of the heavens and over every living thing that moves on the earth’” (Genesis 1:28). Verse 26 lists four groups of creatures: the fish of the sea (דְגַת הַיַּם, degat hayyām), the birds of the heavens (עוֹף הַשָּׁמַיִם, ‛ôp haššamāyim), livestock (בְהֵמָה, be hēmâ), and every creeping thing (רֶמֶשׂ, remeś). It further has the phrase over all the earth, emphasizing the fact that man is to rule over everything God created on earth. Yet there are several ways in which this list differs from the previous description of creation. Fish of the sea are mentioned instead of swarmers of the water. Are fish of the sea to be understood as a subset of swarmers of the water? If so, it could imply that man was not given dominion over all that God created on earth. Are they to be understood as equivalent phrases? If so this could undermine the idea that fish or swarmers are taxonomic terms. A second difference is that only livestock and creepers are mentioned from the land animals. What happened to the beasts of the earth (חַיַּת הָאָרֶץ, ḥayyat hā’āreṣ)? Is man not to rule over them? This seems highly unlikely given the extra phrase “over all the earth”. Perhaps the three terms associated with land creatures are not strict taxonomic terms. Even more interesting, verse 28 only lists three groups of animals: the fish of the sea, the birds of the heavens, and every living thing that moves on the earth. The three terms previously used to describe land animals are not directly mentioned. However, the word translated living thing (חַיַּה, ḥayyâ) is identical to that translated beasts previously. The minor spelling difference is due to the noun being in the absolute form rather than the construct form, which gives the meaning beasts of. The verb for move (רָמַשׂ, rāmaś) is used. This is related to the noun for creeping thing (רֶמֶשׂ, remeś). Livestock (בְהֵמָה, be hēmâ) are not mentioned. This seems to further undermine the assumption that the three terms describing land animals in their creation are taxonomic terms. 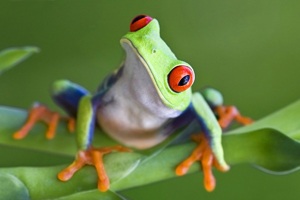 While most amphibians lay eggs directly in the water, the nocturnal red-eyed tree frog lays eggs on the underside of a leaf over a body of water. When the young develop to tadpoles, they hatch and drop to the water below to continue development. Since the adult phase lives primarily on land, it can be argued this frog is from a baramin created on Day 6 as a land animal. God provided food for the creatures he created. In verse 29 he tells people that they may eat seed bearing plants and fruit from trees. In the following verse God describes what he has given the animals to eat. “‘And to every beast of the earth and to every bird of the heavens and to everything that creeps on the earth, everything that has the breath of life, I have given every green plant for food.’ And it was so” (Genesis 1:30). Aquatic life is not mentioned in this verse, although undoubtedly God provided for them.9 Birds, beasts of the earth, and creepers are mentioned. Either all the beasts of the earth (חַיַּת הָאָרֶץ, ḥayyat hā’āreṣ) and all creepers (רֶמֶשׂ, remeś) are equivalent to the animals created previously (vv. 24, 25) or the livestock may end up dying of starvation. This seems to further undercut the idea that God is using taxonomic terms. Instead, it is apparent that there are several different ways of referring to life on earth. This is consistent with more commonly observed patterns in language and undermines the idea that God intended these terms as taxonomic designations. Further examples can be seen in the account where Adam names the animals (Genesis 2:19, 20) and the Flood account (Genesis 6:7, 17, 19, 20; 7:2, 3, 8, 9,20; 14–16, 21–23; 8:1, 17,19). For the sake of brevity, these will not be examined in detail here. One thing that is interesting is the frequency with which three groupings of animals are mentioned in a verse. This appears in Genesis 1:21, 24, 25, 28, and 30. It could be that this has some significance. For example, the phrase “from Dan to Beersheba” is commonly used to refer to all of Israel (Judges 20:1, 1 Samuel 3:20, 2 Samuel 3:10; 17:11; 24:2, 15, 1 Kings 4:25, 1 Chronicles 21:2, 2 Chronicles 30:5). Dan was a city far north in Israel and Beersheba was a city in the south. By mentioning these cities at the extremes of Israel geographically, it was understood that all of Israel was meant. This concept might apply in Genesis 1:28 where the fish of the sea, birds of the heavens, and every living thing that moves on the earth are mentioned. This certainly describes life “in every corner of creation”. Furthermore, the use of three groupings of land animals in the account of their creation (vv. 24, 25) may be intended to emphasize that God created all the different types of land animals. The Hebrew word behēmâ has a broad semantic range according to Strong’s Exhaustive Concordance.10 It can refer to domestic animals, as implied by the translation livestock in Genesis 1, or wild animals. In Genesis 7:2, God tells Noah to take with him on the Ark seven of every clean animal and two each of the animals which are not clean. In each case the word behēmâ is used for animal, indicating a much broader meaning in this context. The word ḥayyâ, used in construct form to designate beasts of the earth, is a general noun used for animals over 100 times in the Hebrew Scriptures. The corresponding verb, ḥāyâ (חָיָה), is used 180 times. As mentioned above, it appears unlikely that the designation beasts of the earth (חַיַּת הָאָרֶץ, ḥayyat hā’āreṣ) is a taxonomic grouping since it is not consistently used across the creation narrative in Genesis. The noun šereṣ appears 15 times, all in the Pentateuch. Twelve of these are directly preceded by the Hebrew word meaning “all” or “every”, suggesting that a broad group of creatures is being described. While it initially is used to describe creatures in the water, it is used extensively in Leviticus to describe unclean animals on earth. It is related to the verb šāraṣ (שָׁרַץ) which appears 14 times in the Hebrew Bible. Again, this verb is used for more than sea creatures. In fact, it is used in reference to humans in Genesis 9:7. The broad use of šereṣ and its related verb suggests that it is not strictly a taxonomic term. Instead, it seems to imply creatures that are active and moving, a characteristic of animate life. The noun remeś and its verbal form rāmaś each occur 17 times in the Hebrew. Again these words imply movement and overlap the semantic range of šereṣ. For example, while Genesis 1:20 and 21 use šereṣ to describe aquatic creatures, Psalm 104:25 uses remeś. Further, the verb rāmaś is used to describe movement in the šereṣ created on Day 5. The word ‛ôp is used the most consistently throughout the creation narrative. The ‛ôp fly (עוּף, ‛ûp) and have wings (Genesis 1:20, 21). This brings out an important pattern in the creation account. The swarmers (šereṣ) swarm (šāraṣ) in the waters, the birds, or flyers, (‛ôp) fly (‛ûp) in the heavens, and the creepers (remeś) creep (rāmaś) on the earth. Throughout all of creation there is movement associated with life! Of all the Hebrew words we have examined, one still seems to hold potential as a taxonomic term. The word ‛ôp is commonly translated bird, although it is known to refer to more than just birds. For example, bats are listed among the unclean ‛ôp in Leviticus 11:13–19. Two previous studies disagree on what other animals might be included with ‛ôp. Berndt argued that all flying insects would be included.11 The only qualifiers for ‛ôp in Genesis are that they have wings and fly, which clearly allows for the inclusion of animals besides birds. Further, Leviticus 11:20–23 discusses flying insects (שֶׁרֶץ הָעוֹף, šereṣ hā‛ôp), which could be more literally translated “the swarmers of the flyers”. From a limited examination of the Hebrew terms used in creation, it does not appear that God intended to give us a list of taxonomic terms. Berndt points out some of the challenges that are still faced if insects are included within the ‛ôp. Not all insects have wings and fly. Loss of structures such as wings is not uncommon.14 Berndt considers that all true insects flew at Creation and states: “Insects that used to fly … but have lost the information content for wings, either entirely and preferentially (New Zealand’s weta, with no natural predators), or in part within their Kinds (ants, cockroaches), are still to be regarded as insects.”11 This still leaves some creatures with three body segments and six legs that may never have had winged ancestors. It seems more natural to me to leave the standard definition of insects alone and just recognize that most were probably associated with the ‛ôp at creation. It doesn’t appear to be a problem that different mammals were created to inhabit land, sea, and air. The creation account seems to suggest some discontinuity between creatures inhabiting the sea, air, and land. Land animals were created on a separate day from creatures of the seas and sky. Furthermore, creatures in the water and sky seem to be portrayed as being distinct. This may provide some guidance to creationist taxonomies. However, within a creature’s life-cycle they may inhabit several different realms. In insects, larvae may develop in the water while the adult forms fly. It might be inferred that life was created fully formed and ready to reproduce and fill the earth. This would suggest that dragonflies are flyers created on Day 5 and amphibians are land creatures created on Day 6. 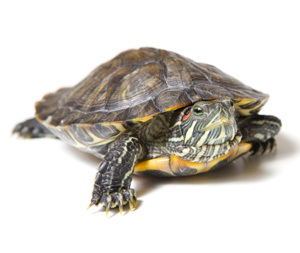 Turtles in the family Emydidae vary from terrestrial to aquatic. It may be that they are land creatures created on Day 6 and some have adapted to spend more time in water. They lay their eggs on land. Serious study of Scripture must always play an important role in guiding the development of creationist models. From a limited examination of the Hebrew terms used in creation, it does not appear that God intended to give us a list of taxonomic terms. Instead, the accounts appear to reflect the fact that God created all life in “every corner” of the earth: sea, sky, and land. Life in all these regions is animate and active. God put them under the dominion of people and provided for them. Of all the groups of creatures listed, the birds (עוֹף, ‛ôp) appear to be used most consistently. These winged flying creatures include more than just birds, but also bats and flying insects. 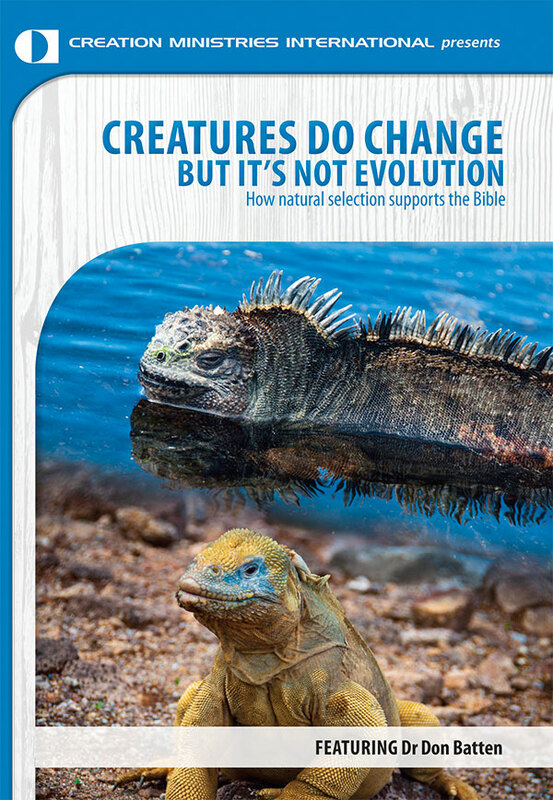 Since the creatures in the water and sky were created on a separate day from terrestrial creatures, there may be some discontinuity between these groups that could be useful in developing creationist taxonomies. Further detailed study of Scripture and baramins is necessary before reaching strong conclusions on this matter. In the Flood account we have a record which puts clear limits on the amount of genetic diversity within some kinds of animals. For example, there was only a single pair that survived the Flood for all unclean animals. This means a maximum of four alleles would have been carried into the post-Flood world by them. Studies of allelic diversity in unclean animals make it clear that mutation has added diversity within these kinds. The same is true of humans who would have brought a maximum of 10 alleles through the Flood, barring mutations in Noah’s sons. Lightner, J.K., Genetics of coat color I: the Melanocortin 1 Receptor (MC1R), Answers Research Journal 1:109–116, 2008. Return to text. McConnachie, M. and Brophy, T.R., A biblical word analysis for the Landfowl (Aves:Galliformes), Occasional papers of the BSG 10:20–21, 2007. Lightner, J.K., Identification of species within the sheep-goat kind (Tsoan monobaramin), Journal of Creation 20(3):61–65, 2006; Lightner, J.K., Identification of species within the cattle monobaramin (kind), Journal of Creation 21(1):119–122, 2007. Return to text. Stambaugh, J., ‘Life’ according to the Bible, and scientific evidence, Creation Ex Nihilo Technical Journal (Now Journal of Creation ) 6(2):98–121, 1992. Kennard, D., Hebrew metaphysic: life, holy, clean, righteous, and sacrifice, Answers Research Journal 1:169–195, 2008. Return to text. William, P.J., What does min mean? Creation Ex Nihilo Technical Journal (Now Journal of Creation) 11(3):344–352, 1997. Turner, K.J., The kind-ness of God: a theological reflection of mîn, “kind”, CORE Issues in Creation 5:31–64, 2009. Return to text. Berndt, C., Biblical Classification of Life: A Framework and Reference for Authentic Biblical Biology, Elihu Publishing, 2000. Klenck, J.D., Major terrestrial animal taxonomic classifications as defined by God, Journal of Creation 23(2):118–123, 2009. Return to text. For this study, Bibleworks v. 7.0 was the major reference used. Return to text. English standard version (ESV), Crossway Books/Good News Publishers, Wheaton, IL, BibleWorks, v. 7, 2001. Return to text. Kennard, D., Potential evil in the biblical account of the original good creation, Occasional papers of the BSG 10:15–16, 2007. Return to text. If God had mentioned food for aquatic life, one wonders what word would be used for plankton. Return to text. Strong, J., Strong’s Exhaustive Concordance of the Bible, #929, BibleWorks. v.7.0, 2001. Return to text. 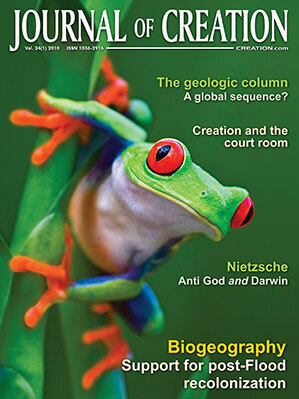 Berndt, C., The Unified Owph: Birds and Insects in Creation, November 2009. Return to text. Klenck, ref 5. Return to text. Harris, et al., Theological Wordbook of the Old Testament, #1582a, BibleWorks 7.0, 2001. Return to text. Wieland, C., Beetle bloopers: flightless insects on windswept islands, Creation 19(3):30, 1997; creation.com/beetle-bloopers. Return to text. Harding, J.H. and Davis, S.K., Clemmys insculpta (Wood Turtle) and Emydoidea blandingii (Blanding’s Turtle) hybridization, Herpetological Review 30(4):225–226, 1999. Return to text.